The U SPORTS football national semifinals took place Saturday in the Mitchell and Uteck Bowls. In the Mitchell Bowl out west, the No. 1 Laval Rouge et Or bested the No. 4 Calgary Dinos 35-23 to head to their 11th Vanier Cup. It was the Rouge et Or’s sixth win over the Dinos in six playoff matchups, including last year’s Vanier Cup (a 31-26 Laval win), and their second win in Calgary in that span (the previous one was a 41-10 victory in the 2011 Mitchell Bowl). Quarterback Hugo Richard was particularly impressive, completing 21 of 32 passes (65.6 per cent) for 258 yards and two touchdowns and rushing eight times for 31 yards, while receiver Breton Robert hauled in seven passes for 109 yards and a touchdown and running back Vincent Alarie-Tardif rushed 15 times for 76 yards and a touchdown. On defence, Laval forced three fumbles and recovered two of those. Calgary came out strong early and took a 17-10 lead into the half, the same margin they led by at halftime in last year’s Vanier Cup. And like last year, the Rouge et Or came storming back. They were able to put up a touchdown drive and a third goal to a rouge in the third quarter, taking a 20-18 lead into the final frame, and extended that lead further when Deane Leonard fumbled a punt and Gabriel Ouellet recovered for a touchdown. The Laval defence also came up strong in the final half; the Dinos put up good stats on the day, including quarterback Adam Sinagra’s 318 passing yards (on a 26 for 43 performance with no touchdowns and one interception), while receiver Hunter Karl made nine catches for 134 yards, but the Rouge et Or held Calgary to 124 offensive yards in the final 30 minutes to seal the victory. The Rouge et Or will face the No. 2 Western Mustangs this coming Saturday in the Vanier Cup in Hamilton, following Western’s 81-3 win over the No. 7 Acadia Axemen in the Uteck Bowl. The Axemen advanced there with a 45-38 overtime win over the No. 8 Saint Mary’s Huskies in Tuesday’s Loney Bowl conference championship. The Mustangs’ win Saturday set records for the most points scored in a national semifinal (the previous record was 60, by Saint Mary’s in 2003) and for margin of victory. 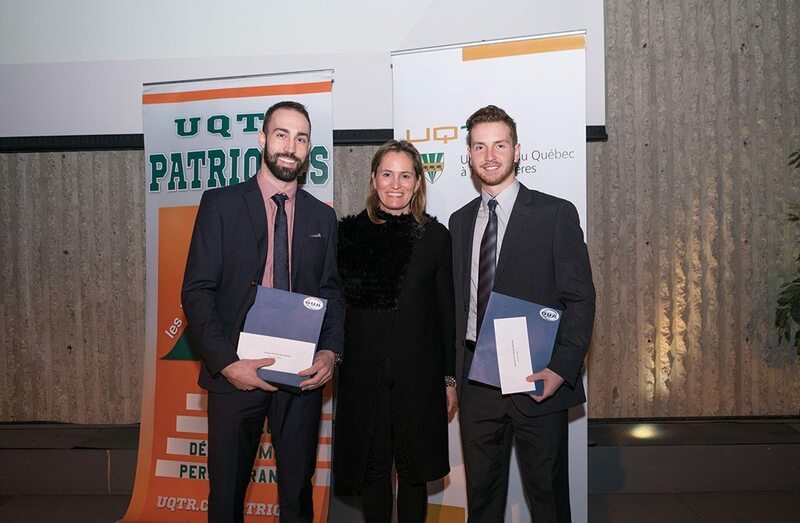 Quarterback Chris Merchant was named Uteck Bowl MVP after a remarkable performance, completing 10 of 11 passes for 200 yards and two touchdowns, while running back Trey Humes had 172 rushing yards and a touchdown on 15 carries. This will be Western’s first appearance in the Vanier Cup since 2008, where they also played Laval in Hamilton. The Rouge et Or won that one 44-21. Some remarkable men’s basketball history was made this weekend, with fifth-year University of New Brunswick Varsity Reds guard Javon Masters becoming the all-time AUS leading scorer with 37 points against the Saint Mary’s Huskies Friday. Heading into the game, Masters needed 35 points to reach that mark, and got there thanks to pouring in 27 second-half points and leading the Varsity Reds to a comeback. UNB trailed 47-30 at the half and 59-56 after the third quarter, but outscored the Huskies 27-13 in the final frame. Masters notched his 37 points on 13-for-23 shooting, while adding six rebounds, six assists and four steals. He broke the AUS career record of 2,069 points (set by UPEI’s Curtis Robinson between 1991 and 1996) with a three-pointer with 1:10 to play. "I'm just overly joyed,” he said. "It's a record that's been there for some time, it means a lot. …I know the first half wasn't really what we wanted. Coach Baker got us into the room and told us to buckle down, get some stops and get it in transition, and we'd have a good chance to win the game." "Saint Mary's is always a difficult team for us to play, especially here. For us to get down and grind out a big win here, it means a lot," Masters said. "My shot wasn't falling in the first half, but as soon as I got a couple to the basket and got to the free throw line, I knew that any time I put the ball up it was probably going to go in." Elsewhere in men’s basketball, there were a couple of notable Top 10 upsets. The No. 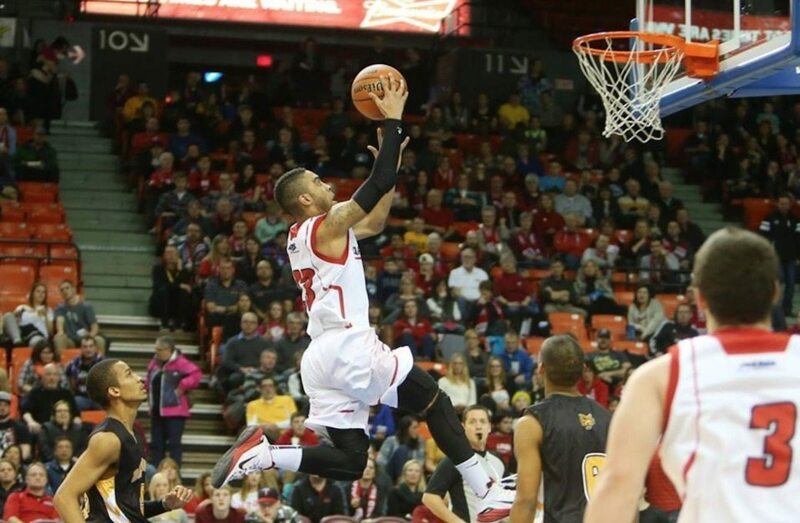 4 Calgary Dinos fell to the Brandon Bobcats 69-64 Saturday, while the No. 5 Dalhousie Tigers lost 70-67 to the Acadia Axemen Thursday. And in not an upset, but a Top 10 loss, the No. 9 Ottawa Gee-Gees fell 74-53 to the No. 1 Carleton Ravens Tuesday. One notable women’s volleyball result this weekend came in the AUS league tournament, held to wrap up the first half of the season. The No. 3 Dalhousie Tigers posted straight-sets wins over Memorial, Moncton, and UNB during the tournament, but then fell in straight sets to the Acadia Axewomen Sunday. Lauryn Renzella led Acadia with 15 kills and nine digs, while Keiley Evans had 18 digs. Elsewhere in the Top 10, the No. 1 UBC Thunderbirds beat the No. 4 Alberta Pandas in straight sets Friday, Alberta’s first 3-0 loss at home in four years, but the Pandas returned the favour with a three sets to one win Saturday. Also, the No. 8 Mount Royal Cougars fell in straight sets to the Trinity Western Spartans Friday. There were some notable results at the top of the men’s hockey rankings this weekend, with the No. 2 UNB Varsity Reds’ 3-2 road overtime loss to the No. 4 St. Francis Xavier X-Men Friday particularly standing out. Chase Marchand stood out for St. FX, making 46 saves and earning player of the game honours. Tristan Pomerleau scored early for UNB, while Matt Needham and Holden Cook replied for StFX. Marcus McIvor tied the game for the Varsity Reds with just 2:38 left to play and sent it to overtime, but Michael Clarke scored the winner for StFX on the power play 39 seconds into overtime. The X-Men then beat UPEI 6-1 Saturday, while UNB bounced back with a 4-3 win over Dalhousie. The Ottawa Gee-Gees had an excellent weekend, with a comeback finally paying off against the No. 8 Carleton Ravens and producing a 4-3 win in Friday’s second-annual Colonel By Classic in The Arena at TD Place. 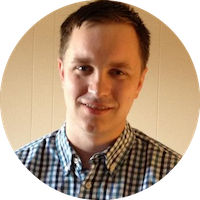 Ottawa had previously had two failed comeback attempts against Carleton this year. In this one, they trailed 2-1 going into the third, but then got goals from Mitchell Gibson and Médric Mercier. The eventual winning goal came in a bizarre way, with Kevin Domingue’s shot going high over the net, rebounding off the glass, then hitting Ottawa goalie Francois Brassard in the back and falling into the net. Ryan Van Stralen brought the Ravens closer with a goal with 5.7 seconds left, but it wasn’t enough. On Saturday, Carleton lost 4-2 to the UQTR Patriotes, while Ottawa beat RMC 2-1 in overtime. Elsewhere in the Top 10, the No. 1 Alberta Golden Bears came up with a 6-1 road win over the No. 3 Saskatchewan Huskies Friday, but the Huskies responded with a 4-0 win of their own in Saturday’s rematch. Also on Saturday, the No. 7 York Lions lost 5-3 to the Windsor Lancers and the No. 10 Calgary Dinos lost 3-2 to the Regina Cougars. "Heather deserves so much credit for coming all the way back from a weaker season last year and is starting to post near-best times already this early in the season," MacDonald said. "A lot of athletes would have buckled but she came back determined and she is on fire." "Ian is learning to push himself out of his comfort zone in training and now in meets," Kiefer said. "That will help him advance his career for sure." Meanwhile, the Tigers posted 1,114 points on the women’s side and 981.5 on the men’s side (Acadia was second on both sides with 544 and 772.5 points respectively). Lise Cinq-Mars, Isabel Sarty and Alec Karlsen led the way for Dalhousie, with Cinq-Mars winning the 200m freestyle and 50m butterfly and Sarty winning the 100m and 200m freestyle events, both in U SPORTS qualifying times. Karlsen met the qualifying mark with a win in the 200m freestyle and also won the 200m individual medley. The Bishop’s Gaiters came up with one of the most impressive women’s basketball wins this weekend, beating the Laval Rouge et Or 75-71 Friday. Ashley Milhomme was particularly impressive off the bench, notching 22 points and three rebounds. Mara Marchizotta added 11 points and nine rebounds. Elsewhere Friday, the No. 4 Carleton Ravens beat the No. 5 Windsor Lancers 70-46, led by 13 points from Catherine Traer and 11 rebounds from Nicole Gilmore. Carleton then downed the Western Mustangs 71-48 Saturday. The MacEwan Griffins earned their first win of the season on the road Saturday against the Manitoba Bisons, who beat them in straight sets Friday. On Saturday, MacEwan outlasted Manitoba 25-20, 30-32, 25-15, 20-25, 19-17, led by 12 blocks (a Griffins’ record) and 12 kills from Max Vriend and 23 kills from Ryan Zachary. Elsewhere in men’s volleyball, the No. 6 Alberta Golden Bears picked up a home split with the No. 2 UBC Thunderbirds, losing in five sets Friday before winning in four sets Saturday. The No. 1 Trinity Western Spartans also earned a pair of straight-set wins over the Mount Royal Cougars this weekend. There were a couple of notable upsets in women’s hockey this weekend, with the No. 6 St. Francis Xavier X-Women beating the No. 2 Saint Mary’s Huskies 3-1 Friday and the Ottawa Gee-Gees besting the No. 5 Concordia Stingers 2-1 Friday. Emily Power, Emerson Elliott and Kristen McKinley scored for StFX in their win against SMU, while Laurence Morissette and Melodie Bouchard scored for the Gee-Gees against the Stingers. On Sunday, StFX continued with a 4-1 win over Moncton, while Saint Mary’s bounced back to beat UPEI 5-2, and Concordia beat Montreal 3-2 in a shootout. The Regina Cougars came up with an impressive 21-14 dual meet win over the Calgary Dinos Friday. In the 51-kilogram class, Regina’s Amber Wiebe beat Calgary’s Ciara Corbett. Tina Trombley (48kg), Erica Ravelo (55kg) and Maeghan Wild (63kg) also scored wins for Regina. W?♀️ | The Cougars took down Calgary in a dual on Friday night. Next up is the Cougar Invitational on Saturday at the CKHS! Wasn't there just volleyball here? Out East, the Brock Badgers won the York Open on both the men's and women's sides. Brock finished with 28 points on the men's side, ahead of Concordia (26) and Lakehead (23), and with 39 points on the women's side, ahead of York (16) and Concordia (15). Individual Badgers champions on the women's side included Tina Maclaren (55 kg class), Skylar Grote (67 kg) and Shauna Kuebeck (72 kg), and on the men's side, Ligrit Sadiku (57 kg) and Mizam Tamaradze (65 kg). The first ever national champion of men’s university rugby has been crowned. 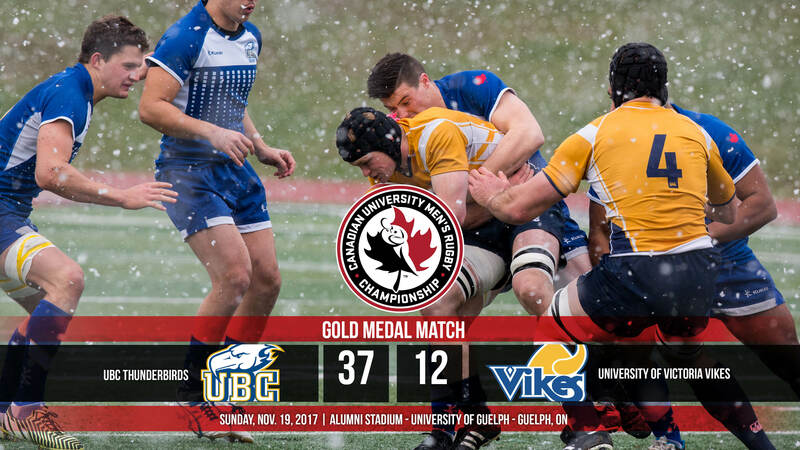 The UBC Thunderbirds defeated their provincial rival Victoria Vikes 37-12 in the inaugural gold medal game at the Canadian University Men’s Rugby Championship on a cold, snowy afternoon Sunday afternoon at the University of Guelph’s Alumni Stadium. Masters celebrated taking over the AUS scoring title with a tweet thanking his coaches and parents. To everyone who had congratulated me thus far.. thank you so much! So much effort and hours have come to this moment right now and I just wanna thank @VarsityReds @UNB_Basketball for the opportunity 5 years ago! And of course my parents!! !